One of the hottest rising trends right now is a “Fire and Ice” themed Prom. The concepts of fire and ice are certainly symbolic, but they are also fun for Prom night because there are countless ways to “spin” these concepts creatively. We’ve put together a list for you of just some of our favorite ideas to bring a “Fire and Ice” theme to life. A “fire and ice” Prom theme is all about contrast: hot and cold, and dark and light. Keep this in mind when choosing your decorations for this theme. This is also one theme where it is okay to be very literal–think oranges and reds for “fire” and whites and blues for ice. Use Pipe and Drapes to create red or blue fabric backdrops and light them up with Mini Lights. Set up fake flame lamps on tables for centerpieces. Use color-changing tea lights on your Prom tables. Some Chandeliers come with light kits; add different color bulbs to them! Cut Gossamer into flame or icicle shapes and suspend them from the ceiling. 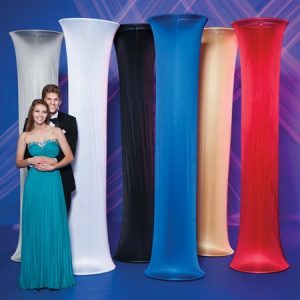 Place Red and Blue Fabric Columns in your Prom space to represent fire and ice. Once you have selected your decorations, it’s time to choose your Prom favors. Once again, being literal can be very helpful for this task; choose red favors for “fire” and blue favors for “ice.” You can also look for any of our full-color favors and add our Fire and Ice graphic so the elements of fire and ice are combined in one favor. Your fire and ice theme can also be used to crown your Prom King and Queen! The same color scheme can be used to choose your sashes and robes–even tiaras. And we also offer full-color sashes and crowns to match your favors. No matter how you decide to decorate for your “Fire and Ice” Prom theme, this is a theme idea that has a lot of potential. Be creative and imaginative with your décor, favors, and royalty–it’s sure to show in the end, and your students will love the results.